This pasta is made with 100% whole durum wheat semolina, obtained by an exclusive process in Barilla's mills, to give you the maximum of 'al dente' taste every day. 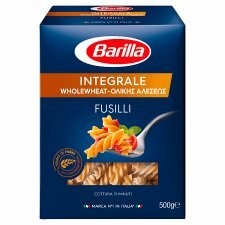 Add whole wheat to your day: a 85g serving of Barilla Integrale pasta will provide you with more than 20% of your daily requirement of fibre. With Barilla Integrale whole wheat pasta, you can experience the whole taste of vitality every day. Bring wate to a fast boil and salt. Add pasta and cook for 11 minutes, stirring occasionally. Drain and serve. Cut the cherry tomatoes into wedges and chop the leek into julienne strips. Fry the chopped leek in a frying pan with the oil and add the tomatoes, adding salt and pepper to taste. 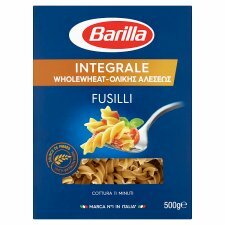 Cook the Barilla Integrale Fusilli in plenty of salted water, drain when "al dente" and add them to the sauce. Toss in the pan and add the diced mozzarella and chopped rocket.